With a wide-range of tools, the Encentivizer will change the way you work. Our cloud-based platform is the perfect fit for companies of all sizes. 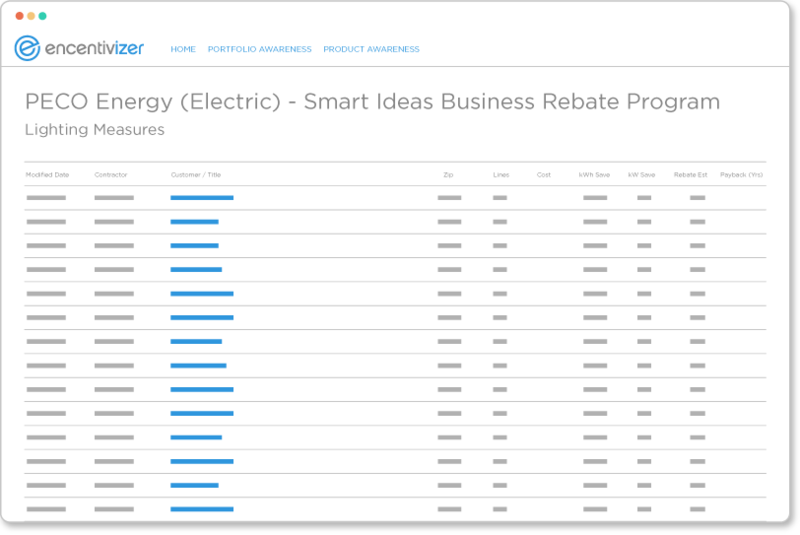 Close deals like never before and improve every aspect of your current workflow to submit energy efficiency rebates. Deliver accurate estimates, proposals and contracts to your clients within seconds – not days. 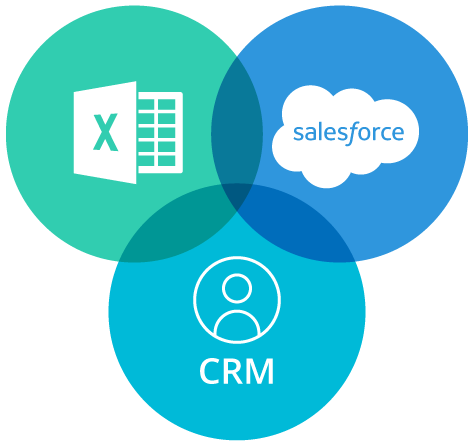 Use programs you’re used to – The Encentivizer integrates with Microsoft Excel®, Salesforce® and other CRM systems or your own third party application. 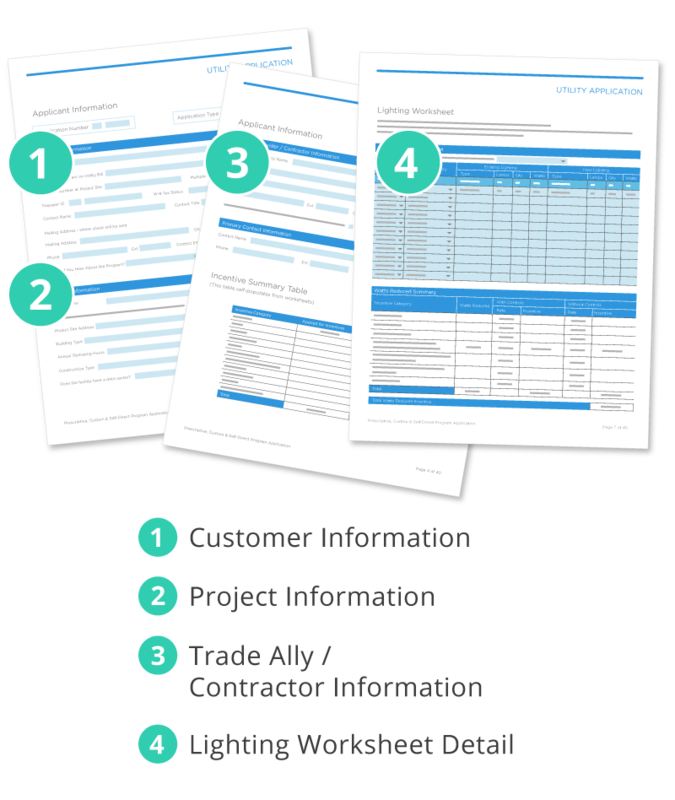 Connect your projects with the most complete, up-to-date set of rebate programs, project financing options and qualified products right now. 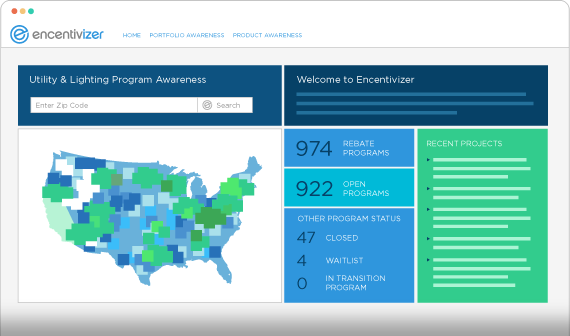 Let us show you what the Encentivizer platform can do for your business. There are a lot of energy efficiency rebates out there – Encentivizer Awareness™ helps you find them. Reinvent the way you manage energy efficiency rebates from start to finish – improve awareness, drive intelligent decision making and bring agility to your department. Awareness can integrate via an API into your website or other energy efficiency tools. Seamlessly educate and inform your site visitors of the latest rebate and financing programs – and link directly to your product catalog for a comprehensive user experience. The most advanced and reliable rebate program intelligence in the industry. Streamline efficiency for multi-site proposals with sites that may or may not be located in one utility territory -quickly add high-level rebate estimates to a site list. Visually discover what locations offer the highest rebates and best financing options all on an interactive map! This will allow you to quickly prioritize project rollout plans and ensure maximum ROI. Instantly find products that qualify for rebates and see the rebate on a product level. Use meaningful product data that you can modify to meet your customer’s changing needs. 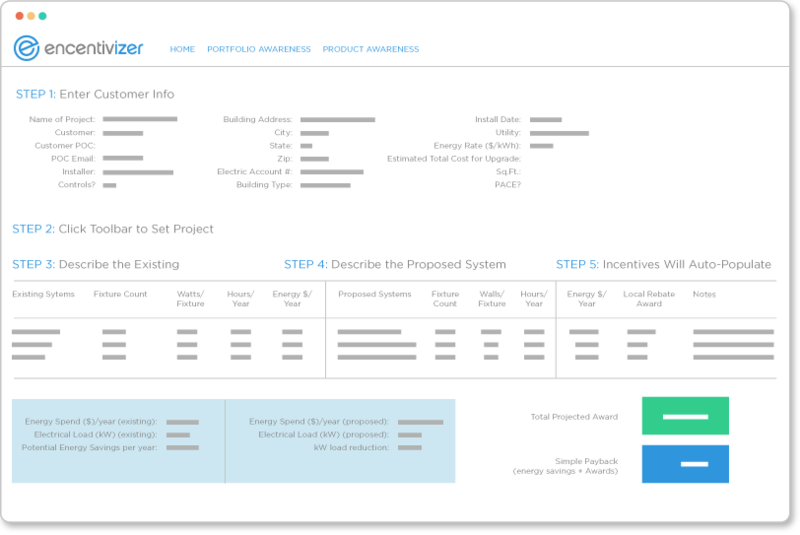 Get real-time energy savings calculations, incentive estimates and program details for both custom and prescriptive measures. 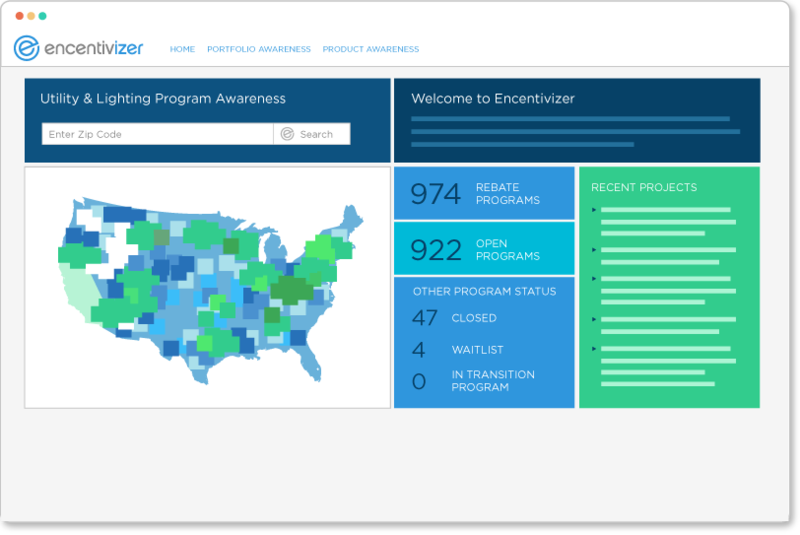 Meet the Encentivizer Project Estimator. Estimate energy efficiency rebates for any utility in the US or Canada without spending time navigating complicated utility programs. You can get the app to have all the features of Encentivizer Project Estimator on-the-go. In SOME utility programs we can build accurate applications that auto-populate with your project data. No more typing all of the tedious product details – imagine how much time you’ll save with Encentivizer Intel-E-Fill™. Contact us if you want to see if it’s available for your utility. 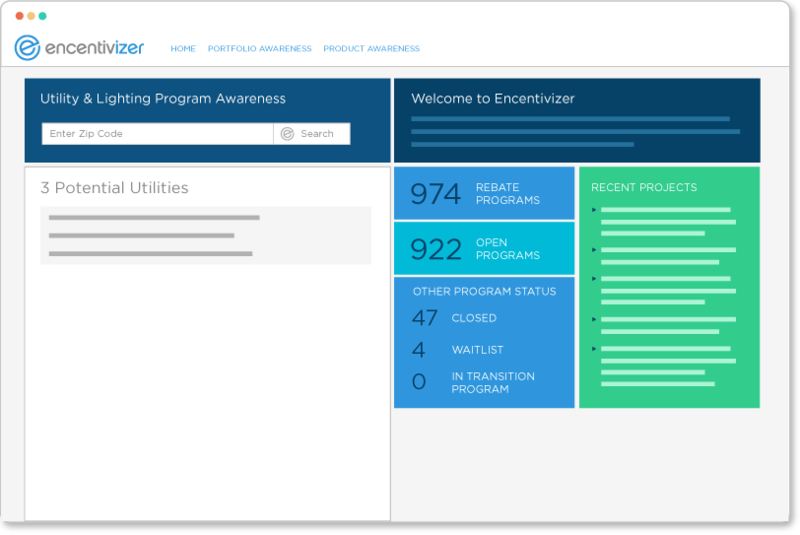 Encentiv Energy is transforming the way people make purchasing decisions for energy efficient products. By providing tools that seamlessly integrate into the workflow of energy efficiency providers, we make accessing rebates and financing a more straightforward and painless process. Get access to exclusive content, industry news and more!